This shower chair is a safety chair manufactured with drain holes in the seat to reduce slipping. 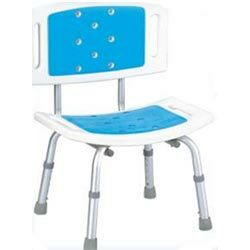 Constructed with durable and corrosion proof aluminium, shower chair can support up to ±110 kg. This shower chair is the deluxe model that easy assembles without any tools. Its best for those that need assistance when showering.